Gellidus, known to many as Frost, is the last remaining Dragon Overlord upon the face of Krynn. This terrifying foe plans to achieve ultimate power through the dark magic of his dead cousins and a terrible pact with the powers of evil. Only the bravery and sacrifice of true heroes will be able to stop the monstrous wyrm. Price of Courage embraces the tradition of Dragonlance adventures by concluding the three-part story arc that began with Key of Destiny and continued in Spectre of Sorrows. It can also be the launching point for a new, high-level campaign. 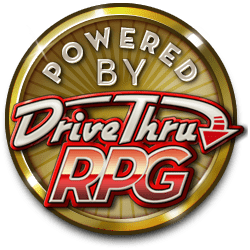 The adventure is designed for characters of 14th level and requires the use of the Dragonlance Campaign Setting and d20 System core rulebooks from Wizards of the Coast. Though not required, play may be enhanced using the Age of Mortals sourcebook and the Bestiary of Krynn. Price of Courage is the third in a trilogy of epic Dragonlance adventures. Price of Courage (2006), by Cam Banks, is volume three in the Dragonlance Age of Mortals Campaign for D&D 3.5e. It was published in November 2006. About the Cover. 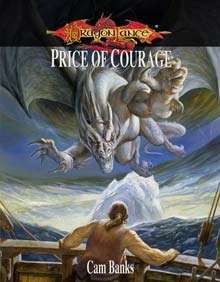 The cover of Price of Courage is once more by Jeff Easley, and his presence was particularly appropriate here: Easley had drawn the original appearances of the Dragon Overlords in the Fifth Age SAGA line (1996-2000), and now he got to paint their final appearance too, as Frost swoops to the attack. The cover also recalls Sleet's nautical attack on the cover of DL6: "Dragons of Ice" (1985), which Sovereign Press would soon reuse as the cover to Dragons of Winter (2007). Concluding the Age of Mortals Campaign. Five great Dragon Overlords invaded Krynn during the "Dawning of a New Age" trilogy (1996-1998), but four of them fell during the War of Souls. Beryllinthranox, Khellendros, and Malystryx met their end in the "War of Souls" trilogy (2000-2002) proper, while Onysablet died in The Lake of Death (2004), set around the same time. That left only Gellidus (Frost). The fate of this final Overlord was one of the loose ends that Sovereign Press was allowed to close up in their Age of Mortals Campaign. In fact, author Cam Banks just had one directive for designing this adventure: "Kill Frost". Sovereign was also given the OK to determine the fate of two survivors of the War of the Lance: the elf Gilthanas and the dragon Silvara, who both make major appearances here. With the completion of their Age of Mortals Campaign, Sovereign Press would soon be entering their final days of Dragonlance publication. In April 2007 — around the time they published their next book, Bestiary of Krynn, Revised (2007) — they would announced the upcoming expiration of their license. Size Matters Not. Price of Courage took longer to write than author Banks expected and ended up being much longer. It finally arrived 16 months after the publication of Spectre of Sorrows (2005) and was 362 pages long! This made it the longest Dragonlance RPG product to date, in advance of War of the Lance (2004) at 320 pages. Adventuring Tropes: A New Saga. The Age of Mortals Campaign generally recreated the style of the original Dragonlance Saga (1984-1986) by mixing wilderness travels with city interludes and dungeon crawls, all as part of a global epic. However, the powerful spellcasters of D&D 3e (2000-2008) made this increasing difficulty at higher levels. Spectre of Sorrows had used the crutch of a teleport-resistant artifact to keep players traveling through the wilds, but Price of Courage decided to go a different way. Rather than trying to prevent spellcasters from teleporting around in Price of Courage, author Banks made that a part of the adventure. Chapters 2-6 of the seven-part adventure are widely scattered and can be played in any order. Players can choose to hike, fly, or teleport to different regions across Ansalon, with the campaign picking up as they reach each locale. This large degree of player agency is supported through a "Calatina reading" — a prophetic device that sets players on their many paths while also determining the exact goals of the villains and the ending of the adventure. This was another callback to the original saga, since Tracy Hickman had used a similar technique in DL13: "Dragons of Truth" (1985) and DL14: "Dragons of Triumph" (1986) — as well as in older adventures like the classic I6: "Ravenloft" (1983). Price of Courage is also structured a bit differently from the previous Age of Mortals adventures (and from other D&D modules, generally). Though there's a strong, underlying plot, the individual locales are heavily detailed with "adventure sites" acting as individual sandboxes, each describing "things to do" and "what people know". Other sections in Price of Courage detail random encounters, plot-based scenes, and of course dungeons — all in a highly organized way. Finally, Price of Courage differs from the previous Age of Mortals adventures in one other way: it returns to the precepts of the original Dragonlance Saga by focusing heavily on dragons. They'd been a minor feature in each of the previous two adventures, but here there are no less than four dragons of note: a copper dragon trapped in a dragon orb, two minor dragonlords, and the last Dragon Overlord. Expanding D&D. With its breadth, Price of Courage has a global feel to it, something that's enhanced by its new rule system: a Faction System, which allows players to interact with organizations from all across Ansalon. Some found the system too complicated, but it also creates global connections in a way that the core D&D game can't. Expanding Dragonlance. Geographically, Price of Courage details three major areas during the later Age of Mortals. Adventures in Northern Ansalon continue on from the areas explored in Spectre of Sorrows, offering new information on Kalaman, Qlettar, and the hobgoblin country of Throt, including the city of Throtl. Chapter three shifts the adventure toward other planes through Bastion, the Lost Citadel of High Sorcery, which was at the heart of the "The Defenders of Magic" novel trilogy (1994-1995). Numerous other arcane location also get attention including the Last Tower, the Lyceum, the Ruins of Daltigoth, the Stairs of Time, and the Tower of Magus. The final chapters then turn their attention to Frost's domain, the southwestern lands of Ansalon, including the islands of Southern Ergoth and Cristyne. Lands detailed include the ogre capitol of Daltigoth, the Eastwatch Region, the Ergonesti elven lands, and the Frozen Wastes. The end of the Age of Mortals Campaign promises major changes to Krynn, as Frost is killed and Southern Ergoth restored. Price of Courage points toward the "Rise of Solamnia" trilogy (2005-2007) as one of the things depicting what happens next. Cinder is a red dragon and one of the surviving minor dragonlords — until he's killed, that is. He made his first appearance in SAGA books like Dragonlance: Fifth Age (1996) and Wings of Fury (1998). Frost is an alien white dragon and the last Dragon Overlord. After he's killed too, that's it for the alien oppressors. He had been introduced in the "Dragons of a New Age" trilogy (1996-1998). Gilthanas is the sole surviving Companion from the War of the Lance, debuting well back in DL3: "Dragons of Hope" (1984). He reappeared in Spectre of Sorrows as a pawn of Frost, and the players will decide his final fate here. Lyim Rhistadt was a villain in the "Defenders of Magic" trilogy (1994-1995), debuting in Night of the Eye (1994). He was turned into a tree in The Seventh Sentinel (1995). He reappears here as a tree. Silvara is the silver dragon from DL7: "Dragons of Light" (1985), who was revealed to be a captive of Frost in Spectre of Shadows. Her fate will also be determined over the course of the adventure. Sylvana (sometimes Silvyana in older sources) is an ancient Silvanesti queen who was first mentioned in DL12: "Dragons of Faith" (1986) after her lover Waylorn Wyvernsbane was awakened. Her ghoulish ways became more obvious in MC2: "Monstrous Compenium Volume Two" (1990), which introduced her undead witchtlin. After escaping into the River of Time, Sylvana reappeared in the modern-day … where she can now confront the PCs. About the Creators. Banks had contributed to Key of Destiny (2004), written Spectre of Sorrows (2005) from a sketch outline, and now authored the entirety of Price of Courage (2006), making him the major architect behind the Age of Mortals Campaign.